The DuraScoop is a real tool for the one job you as a cat lover probably hate doing. It's cast, end-to-end in one piece, from high-grade rust-resistant ADC-12 aluminum. Then it's hand polished and the ergonomic handle is fitted with a soft non-slip, phthalate-free plastic coating. It's big but lightweight and incredibly durable. It lets you dig out the big clumps, scrape the bottoms and sides of the pan while reducing time, effort and strain on your wrist. The solid enclosed sides are designed to minimize scatter of soiled litter during sifting. And it won't bend or break or flick icky cat doo out of the box or in your face. Assorted colors are mint green, watermelon pink and sky blue. 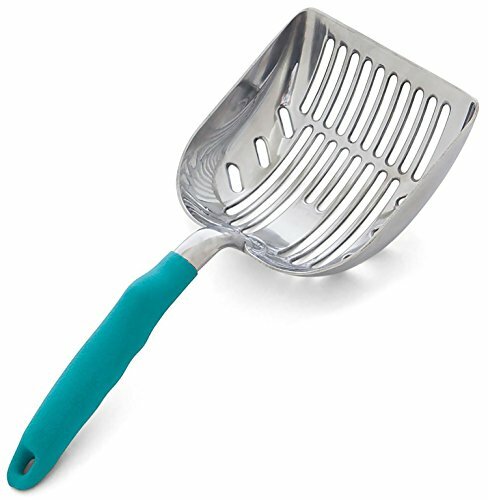 The ONLY end-to-end all-aluminum litter scoop on Amazon, patented design. Solid metal handle with comfortable molded rubber coating. Don't accept inferior partially-plastic substitutes. Jumbo size yet amazingly light in the hand. Ergonomically balanced with center of gravity toward user's wrist. Mirror finish, not plated, coated or painted - will not rub off! Corrosion resistant - will not rust. Multi-cat tested for over 15 years and counting. Designed and sold in the USA. If you have any questions about this product by DuraScoop, contact us by completing and submitting the form below. If you are looking for a specif part number, please include it with your message.